The above info came from QSL, and was edited by yours truly (contact me). The image came from Duel Masters. This anime is about Shobu Kirifuda. 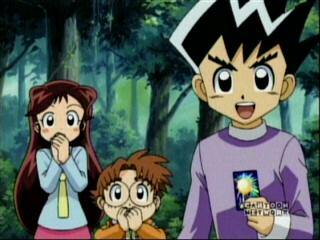 He is trying to become a Kaijudo Master like his father. Duel Masters is a popular game in his hometown and tournaments are held. He has many friends that support him each time he duels. Shobu gets in trouble with his teacher a lot for bringing his deck to school. He also has to deal with a mysterious guy named Knight. As the show progress, Shobu learns that duel masters isn't just a game, it's a challenge to be the best! The above description came from QSL, and was edited by yours truly (contact me).